Definition at line 2532 of file GVN.cpp. Definition at line 2536 of file GVN.cpp. Definition at line 2558 of file GVN.cpp. 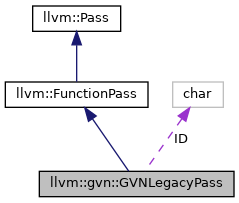 References llvm::AnalysisUsage::addPreserved(), llvm::AnalysisUsage::addRequired(), ID, INITIALIZE_PASS_BEGIN, INITIALIZE_PASS_DEPENDENCY, and INITIALIZE_PASS_END(). Definition at line 2541 of file GVN.cpp. 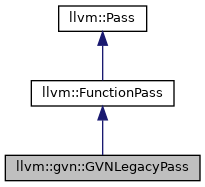 Definition at line 2534 of file GVN.cpp.